The Welsh stage of the Tour of Britain finishes in Swansea. Soon after 1pm the leading riders hurtle through the city centre along Kingsway, which is where the race will also finish, but not before they’ve taken on a couple of steep climbs. First Bryn-y-Môr, near where Dan lives, then Constitution Hill, which is where I plan to be watching. … the leading riders will face a last few metres of flat before the road veers upwards and onto over 300 metres of steep cobbles that lead them up onto the Swansea skyline. Further research indicated that Constitution Hill featured in the Keith Allen’s sensitive, wry evocation of a Swansea youth, Twin Town. The road is now closed to traffic after too many idiots copied the Lewis twins’ driving stunt (seconds 7 to 17 of the YouTube montage above). 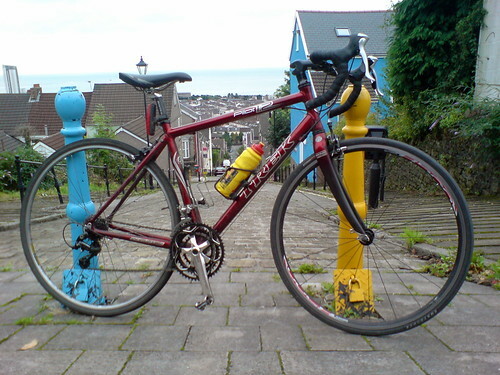 I rode up Constitution Hill on Thursday, on my way back home from Swansea station. The train was 45 minutes late, spoiling my plans to meet the family at Parc Abertawe in time for Toy Story 3. I needed to do something to vent my frustration. It’s a tough little climb, tougher than it looks from the bottom, especially if you’re carrying a rucksack with a 15” laptop in it, but the view from the top over Swansea bay is stunning.